Like many people, the sound of my alarm clock in the morning doesn’t make me leap out of bed with joy. It doesn’t make my mind swirl with the endless possibilities of a day yet to play out. Usually, the piercing sound is met with a swipe at the snooze button, and 10 more minutes blissful slumber. Snap Me Up, however, won’t let that happen. In a nutshell, it’s an alarm clock that won’t switch off until you take a selfie. Now, I know people seem to have lost their minds for the selfie craze, but why you’d want a collection of images taken at the second you wake up is a little beyond my understanding. Still, that is what you end up with if you use Snap Me Up. To set a new alarm, you just tap the red + button and select a time and mode – if you don’t want the selfie option switched on, you can just set an alarm as normal and you’ll wake up to a slow slideshow of images stored on your phone. There’s also a nap timer, for durations of five minutes or longer. In our testing, the app did have a few problems. For example, when used on an LG G4, the selfie function wouldn’t let you take a picture, so the alarm just kept going off endlessly. On the Huawei P8, the alarms just didn’t go off at all. However, on the Galaxy S6 Edge, both alarm options did seem to function as intended. Clearly, it’s a bit buggy still. Each time you dismiss an alarm, whichever sort it is, you get an interstitial advert too, which is pretty much the last thing I want to see first thing in the morning. As a sleep-loving selfie hater, Snap Me Up and I were never destined to be friends. 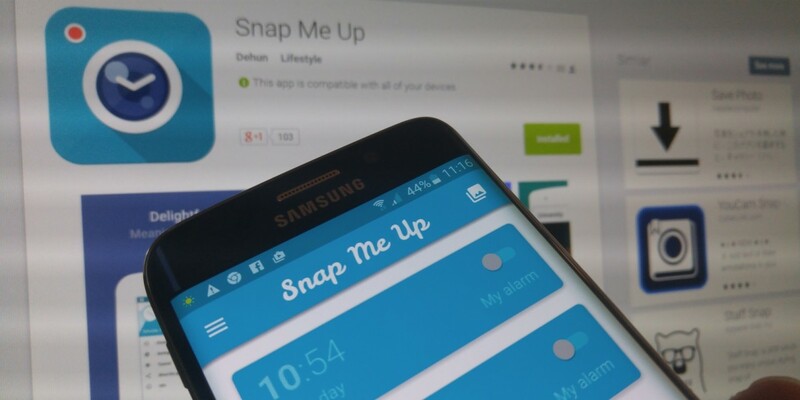 But if you like waking up to a device ceaselessly demanding to see your face before it will shut up, then Snap Me Up is freely available on the Google Play Store. Rather you than me, though.